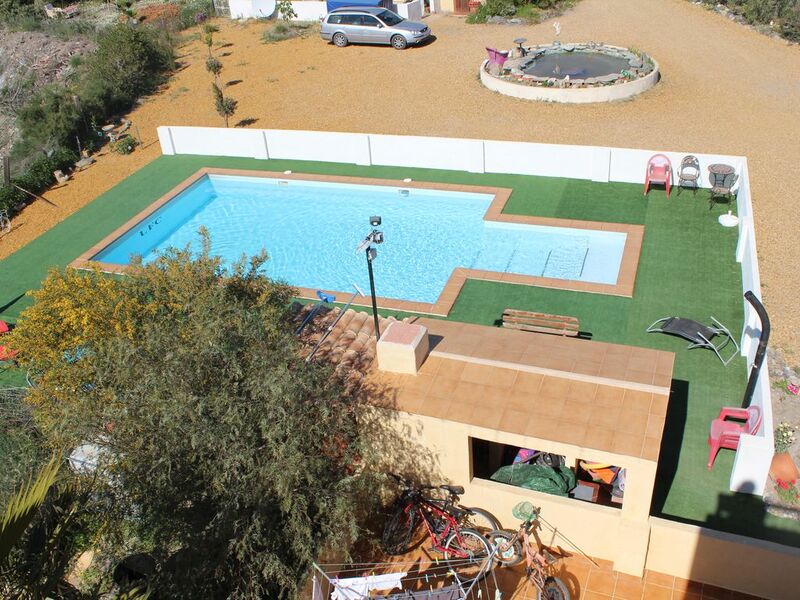 2 bedrooms, sleeps 4, mountain views, pool, Great base for exploring the desert. A modern secluded ground floor chalet. Not on a complex the chalet forms part of a private estate. There are two bedrooms each with a double bed. There is an open plan lounge, dining area and fitted kitchen. A bathroom completes the interior. Heating if required is by a wood burner. The interior is finished to a basic standard and provides a comfortable home from home for your holiday. A welcome pack is provided and there are books and board games provided to add to your enjoyment. The patio area contains seating. There is a pool. There is a play area set up with a football goal so that children and adults can have a kick about. The views are stupendous and the area while being within half hour drive of the city of Almeria is in the rugged Tabernas Desert home of the spaghetti westerns. The village of Tabernas is a 5 minute drive away (walking takes about 20 minutes) the village provides all the usual amenities such as bars, banks, shops and an open air swimming pool. There is an abundance of "things to do" in the area from cave exploring to theme park, water parks to go cart racing. Horse riding in the area. A selection of beaches within a 45 minute drive.The area is most suited to those who like walking and rambling, there are hills to climb and dry waterbeds (ramblers) to explore. The flora and fauna of the area will satisfy those interested in nature. Travel further afield and visit the Alhambra in Granada and the beautiful churches there. Almeria city holds a wealth of history and guided tours. Most of all you are assured of a warm welcome at Casa Buena Vista. Fully equipped kitchen with full size cooker, fridge/freezer, microwave. Lounge diner with comfortable lounge suite, dining table and four chairs. A tv and wood burning stove. Bathroom consists of wash basin, wc and fitted shower cubicle. A cot is available on request. Outside is a walled and gated patio with comfortable patio suite, large table and chairs. A large sun shade. The lounge and patio face south west and the bedrooms face east for the morning sun. The pool is opposite the patio and to the left is the fishpond with live fish. The pool has plenty of sun beds and sports a huge connect 4 ideal for families. There are uninterrupted views to the mountains. We are on the edge of the Tabernas desert so ideal for ramblers, artists and just relaxing. We are a family of 4 generations. Grandma 95 years old, Myself and Husband 70's. My daughter and her husband 30's. My grandchildren 8, 14, 15 and 18. The elderly amongst us speak english, while everyone else speaks a mixture of languages. The province of Almería offers pleasures which are hard to come by in the Mediterranean: over 100 Km. of untamed coastline, and landscapes of outstanding beauty. The peculiarities of the landscape and the bountiful Almerían climate have made this province the perfect place to locate a substantial film industry, and the region has played host to some of the most famous stars of the screen. Its untouched beaches in the east with their emerging nudist complexes and the larger tourist centres in the west offer a quality destination for the more demanding traveller. Its exceptional coastline borders the Cabo de Gata-Níjar Nature Reserve, with long sandy beaches and secluded coves bathed by the warm waters of the Mediterranean. The traditional festivities of the Moors and the Christians will transform your trip to Almería into a wonderful adventure. In the southeast of the Iberian Peninsula, on the shores of the Mediterranean. It has a coastline with 200 Km. of beaches, stretching from Pulpí in the east to Adra in the west. It descends from the Sierra de Gádor mountains until it joins the Mediterranean sea in some exceptionally beautifulbeaches. The views are stupendous and the area while being within half hour drive of the city of Almeria, is in the rugged Tabernas Desert home of the spaghetti westerns. The village of Tabernas is a 5 minute drive away (walking takes about 20 minutes) the village provides all the usual amenities such as bars, banks, shops and an open air swimming pool. Taxi service from the village 7 euros each way, though if any family are going to the village a free lift is offered. There is an abundance of "things to do" in the area from cave exploring to theme park, water parks to go cart racing. Horse riding in the area. A selection of beaches within a 45 minute drive.The area is most suited to those who like walking and rambling, there are hills to climb and dry waterbeds (ramblers) to explore. The flora and fauna of the area will satisfy those interested in nature. Travel further afield and visit the Alhambra in Granada and the beautiful churches there. The city of Almeria holds a wealth of history and guided tours.